In an airtight container, mix coffee and water. Refrigerate for 12 hours. Strain coffee twice through a coffee filter or a fine-mesh strainer. In a saucepan over medium heat, stir together water and sugar until dissolved. Bring to a simmer for 2-3 minutes. Remove from heat. Let cool entirely, then stir in vanilla. Store in an airtight container in the fridge for up to 1 month. 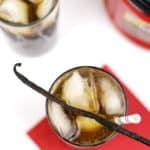 In a tall glass filled with ice, mix vanilla simple syrup and cold brew coffee. Top with sparkling water. Garnish with a straw.